This tip is for Windows 10 (all versions but will come in handy for Creators Update users who have no default shortcuts to Control Panel). Microsoft is bound and determined to get rid of Control Panel in Windows 10 and replace it with Settings. But not so fast. Many Control Panel items are still not included in settings, so it looks like Control Panel will be around a big longer. Those of you with Windows 10 Creators Update have noticed that Control Panel is missing from the Win X menu (right-click the Start button – that’s the Win X menu, which can also be launched by pressing the Windows Key + X). Today, we’ve made a reg file that will let you add Control Panel (with options) to your desktop right-click menu. See? 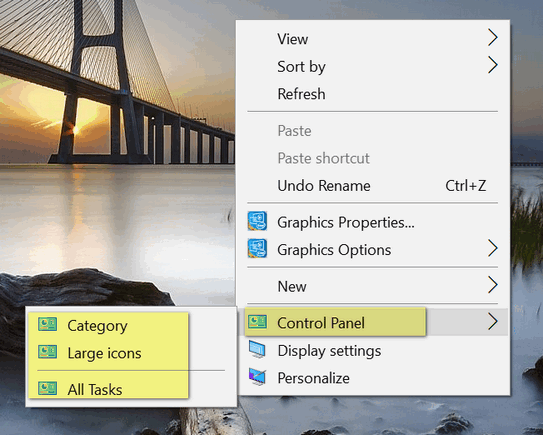 If you see that, then from now on, when you right-click on your desktop, you’ll see Control Panel in your right-click menu with the option so open Control Panel in Category View, Large Icon View, or as a list. We prefer Large Icon View. clicking on your link opens Notepad with all the code in it. There is no link to double click. Nothing works like you say above. Where in the Registry do you paste the code that comes up when you click your link? Fabulous!! Thank you so much!! I have the same comment as Sandy Goga above. All I get is Notepad with the code in it. and then the registry entry. Can you fix it so it will work, please. Thanks for fixing this! It works great. Very helpful. Your “Win Key + R” tip is excellent! Thank you!